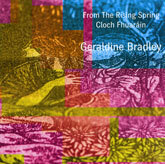 Geraldine Bradley is a member of a musical family from Co. Armagh—her brother Paul is a well-known fiddle player and maker—and a wonderful singer who has just released her first album. Bradley sings in sean-nos style, mostly in Gaelic, and her album departs from the norm in that many of the songs are accompanied. However, the accompaniments, played expertly by a group of excellent musicians (Neil Martin, Paul Bradley, Martin Quinn, and Donal O’Connor among others), are beautifully arranged so as to keep the textures relatively light and to always enhance the mood of the songs. This is a jewel of an album.